Irregularities in the position of teeth are the most common orthodontic problem, and are usually due to lack of space for all the permanent teeth. Because of insufficient space, teeth may erupt into abnormal positions, making them difficult to clean and protect from developing cavities or gum disease. A first phase of orthodontic therapy can usually make the space needed, and avoid the extraction of premolars which was so common in the past. The case shown was treated with a first phase involving expansion and space gaining aplliances, and a second phase with full braces. In other situations, there may be spaces between teeth, or developing permanent teeth may be impacted or even missing. These problems can be successfully treated at an early age although the earlier treatment is started, the more successful and stable the result will be. Many patients will present abnormal bites. The most common of these are overbites, where upper teeth protrude beyond the lowers, underbites where the lower teeth protrude beyond the uppers, or cross-bite where the back teeth do not match properly. Thumb sucking or tongue thrusting may cause an open bite where the teeth do not touch at all. 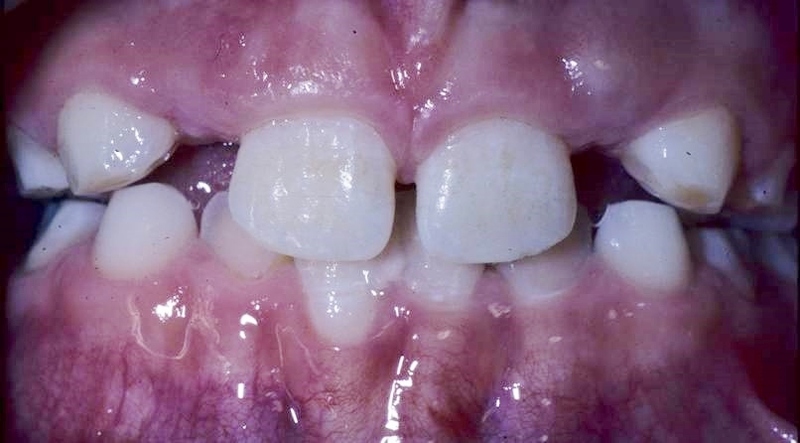 Children with large overbites have a greater incidence of trauma to the front teeth. In addition bite problems can cause abnormal wear of the teeth, difficulty in chewing, damage to supporting bone and gum tissue, and even TMJ (jaw joint) problems. Since an individual’s bite is related to the position of the jaws in the face, some patients will have a related facial abnormality. Minor discrepancies can be alleviated with routine orthodontic treatment. More severe discrepancies may benefit from jaw surgery in conjunction with orthodontics, such as an underbite in an adult.